"The Ghosts of Mars" - Part Four: "Family Matters"
J'onn relives a fight with Aquaman that never happened thanks to his late brother Ma'alefa'ak. Aquaman pleads with J'onn to use his deductive abilities to figure out what is really going on. J'onn finally turns his fury onto Black Manta, who is "really" Ma'alefa'ak. Ma'al drops the illusion and replaces it with another as he explains that he can get on tormenting him forever by causing J'onn to re-experience things that never happened. Ma'al continues taunting J'onn with images of him fighting his fellow heroes before getting taken further into his own mind. The dead Martian becomes angry and insists whoever allowed J'onn to slip from his control isn't mentally strong enough to hide from him. J'onn finds himself in Crime Alley and witnesses the death of Bruce Wayne's parent. "Batman" is there too and informs him that he is the only one who can stop this. J'onn tells him he shouldn't be where he is, but "Batman" counters that he is there adding that he doesn't want him or that thing he calls a brother inside his mind. J'onn tries to fight back but ends up swirling into blackness. 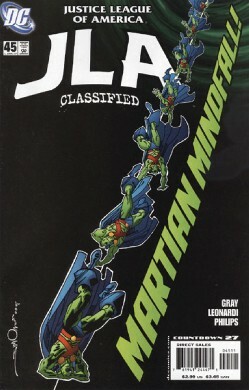 In the real world Ma'alefa'ak, using J'onn's body, fights the Justice League and tries to get the League to kill him. The fight is vicious but Ma'al is able to grab Batman and tells Superman that either the Man of Steel kills him or he kills Batman. Locked inside his own head J'onn searches for a way to escape when a voice in the distance calls to him. Finally he is led to his late wife and daughter, who tell him there isn't much time to stop Ma'alefa'ak. Story - 3: You know, I consider myself a pretty smart guy. I'm not brilliant. It's not like Mensa is beating down my door or anything, but at the same time I have good problem solving skills and have the ability to think quickly on my feet. And yet this issue had me confused. I don't blame myself and that isn't because this is my review and I can do pretty much what I want within the bounds of good taste. I have this weird personality quirk where I think just about everything is my fault. Despite that I blame the confusion I suffered about this issue firmly at the feet of Justin Gray and the horrible story telling abilities he showed in this chapter of "The Ghosts of Mars". This issue opened with more of Ma'alefa'ak messing with J'onn's head, which was fine. This is something that I have come to expect from this story because Gray has beaten us over the head with this for three issues now. Ma'al (for short because typing out the full name is getting kind of annoying) and J'onn bonded on a telepathic and spiritual level and even though Ma'al is dead he can still make J'onn's life miserable. I get that. It's even kind of interesting if not a bit played out at this point. Then we have more of J'onn fighting his fellow Justice Leaguers, complete with images of destruction. Again, by part four we have already seen this and that goes to the heart of my problem with this story. Personally I think this plot warranted maybe three chapters, not five. I think it could have been just as compelling a story and probably more enjoyable. "The Ghosts of Mars" is an example of the dark side of the current style of storytelling, in my opinion, and gives it a bad name. The confusing part was the fact that suddenly we see "what's really happening." It took a second but I finally got that this was the real world, which was jarring. The pacing of the issue left me wondering whether I was still in J'onn's head or not. Sure you had the panel with J'onn falling in a black emptiness but still. One second J'onn's going crazy, the next he's fighting Superman. This transition was handled poorly, pure and simple. And it's a shame too, because this is a story worth telling. There is an emotional heart to the story it's just getting lost in the repetitive scenes of Ma'al messing with J'onn's head. I can get into a story about J'onn being reunited with his late wife and daughter. I just think it could be handled better. I guess my only consolation is that this story arc is going to be over in one issue and it's a shame that I don't like it as much as I do. I like J'onn and was looking forward to reading his showcase story. Too bad it's not all that good. Art - 4: The art for this story has been the only thing I've liked about it and this issue was no exception. Leonardi draws a pretty mean Justice League and even if the writing is poor the images make it bearable. Cover Art - 4: It's good to see a Walt Simonson cover. I think the cover does a solid job of conveying J'onn's decent into madness. All in all a solid cover.